The Berspankled Gazankle is an expansive species inhabiting online dating websites. The Gazankle’s painted-on eyebrows are beyond anything that either Picasso or Salvador Dali ever came up with, and the creature’s processed hair, thick makeup, and elective surgical enhancements are all intentionally severe. Is the Gazankle auditioning to be the villain in the next superhero movie, or is she trying to find a date? Why not do both at the same time? Note that is physically impossible for the Gazankle to take a photo without making a peace sign or duck face because that’s just what you do now. The Berspankled Gazankle posts photos of herself that are more sexually suggestive than what could be seen in any other user profile, at least any you have seen in week’s browsing that particular website, or a month, or ever, and at least half the text of her profile is a response to all the comments made by idiots. 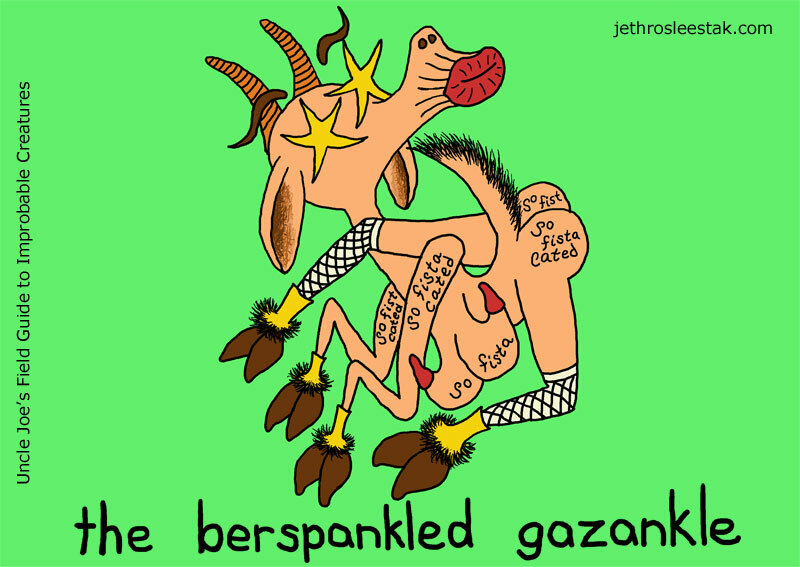 The Berspankled Gazankle is spiritual and artistic and sensitive and is looking for a man who is at least six feet tall and athletic. The Gazankle’s checklist for a prospective partner includes the physical features and careers and peripherals she finds most attractive in a man, plus a statement about what’s on the inside being most important or some other phrase that people use to show that they’re a good person. The Berspankled Gazankle is safe from all predators (human, bear, other) because of the creature’s overpowering aroma, which is basically a mix and match of the latest celebrity scents applied by full immersion. The Club-Gymnoverse. Appears on any dating website a hetero man browses and thinks it can’t make worse matches for him than it already has. Surprise! Check out the Gazankle at 97% match! Really? Oh, it says we both like the color blue. I guess that was it.